Both East Fife's goals at the weekend were straight from their training ground. Pic by Kenny Mackay. East Fife’s 2-1 Scottish Cup victory over Greenock Morton was borne out of the players’ hard work on the training ground. Darren Young had his side well drilled ahead of the game, with set-pieces in particular identified as being a way of getting at their Championship visitors. And that’s the way it worked out for the club, with both goals coming in the win following corner kicks. Young said: “We’d worked on the short corner in training during the week. Watson’s winner, which added to an earlier Anton Dowds strike, ensured East Fife made a safe passage through to the last 16 of the cup. Sunday’s draw saw them paired with Partick Thistle, a club they’ve already beaten this season on their way to the quarter finals of the Irn-Bru Cup. It’s clearly a winnable game, but maybe not the draw the club would have hoped for. “We’ve played them already this season but they’ve made changes since then,” said the Bayview manager. As well as still being part of the Scottish Cup, the Fifers still have to play their long awaited Irn-Bru Cup tie against Bohemians in Dublin. That game is scheduled for a week on Saturday and will be part of a heavy run of fixtures. Looking ahead to the weekend, the Bayview manager says his players will need to maintain their Scottish Cup performance levels when they return to League One duty. 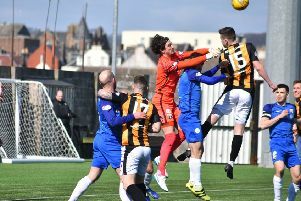 The Fifers face a tough trip to Stranraer on Saturday, aiming to build on the recent victories over Montrose and Greenock Morton. Young insists his side will need to be at its best to take anything off the Blues. He said: “There are no easy teams in this league and Stranraer have been having an OK season. One player who may not play any part at the weekend, or any further part this season, is midfielder Craig Thomson. Thomson has been attracting interest from a few sides with Peterhead, Brechin City, Berwick Rangers, Elgin City and Kelty Hearts all believed to be amongst those be tracking the former St Johnstone man. Thomson has struggled to break through to the Fife first team this season and may follow Scott McBride out of the door after the midfielder left for Kelty Hearts last week. The Fifers have no fresh injury worries ahead of the weekend.